Create A Form or SurveyUsing QuestionPro! 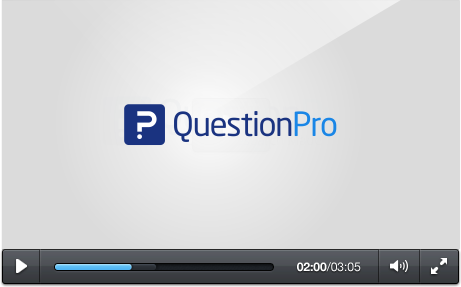 Easily Create A Form Questionnaire With QuestionPro. Start Today With A Free Account! Since QuestionPro is optimized for mobile, you can easily create surveys using your smartphone or table devices. 1. 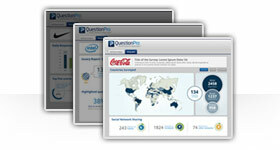 Ready Made Templates: QuestionPro has a huge template library, with over 100 different surveys to choose from. You can browse just to brainstorm some ideas, or you can choose a survey to edit and customize. Check out the template library and create a form survey! 2. Import: If you already have survey questions that you'd like to incorporate, you can upload them with Microsoft Word straight into QuestionPro for further editing. 3. A Blank Survey: If you'd just like to start blank, you can choose from a over 30 question types when creating your survey, easily rearranging them, adding logic and customizing as you see fit. If you work as manager, it can be a great idea to issue an employee satisfaction survey. This can help to recognize issues in the work environment that may be affecting productivity and workplace morale. Anyone working in market research and planning to release new products or services will benefit greatly from the use of surveys. It can give you the perfect idea as to how the market will react to your new product. If you own a business, it's extremely important to obtain the opinions of your customers. Knowing where you are succeeding and where you could use improvement can mean potential new and repeat customers. Teachers and students in academic environments can benefit from taking questionnaires in order to help make the curriculum more streamlined and efficient for everyone involved. Step 3: Pick which method of survey creation you'd like to start with. You can either choose to select a template from the template library, upload questions that you already have and would like to use, or you can begin from a blank template. 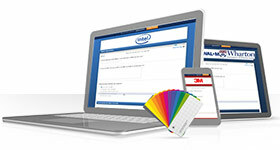 Customize your survey using a variety of options, including changing the theme and fonts. In what ways are you able to create a survey? Do they have a huge template library filled with ready made questionnaires that you can select and edit for your use? What if you happen to have questions that you know you'd like to use but don't wish to type them all up again in the editor? Can you use Microsoft Word and easily import them? If you're just looking to start from a blank template, how many different question types can you choose from? Can you easily rearrange them and add certain customization options like changing the color or fonts used? With QuestionPro, you can do all of this, plus more. With your survey complete and ready for distribution, how many different options do you have? Can you import a list of email addresses to send your survey to? 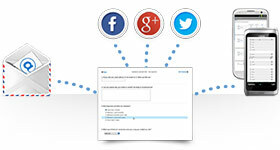 Or what about sending your survey to your social media networks like Facebook or Twitter? Can you easily embed your survey to your website or blog? Or, if you're working a tradeshow or convention, are you able to conduct a survey offline? When you choose QuestionPro, you have all of these available, plus a lot more. When your survey is created and has been sent out, how are you able to analyze your results coming in? Can you see how many people have completed your survey and the average time it took them to complete it? What about creating reports? Can you easily create an infographic or word cloud with just a few clicks? How about analyzing your results? Are you able to create data filters and cross tabs with your data? What about performing in-house trend and TURF analysis? If you just need your results backed up to the cloud like Dropbox or Google Docs, are you able to do that? 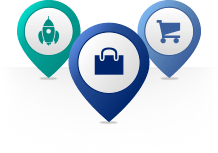 QuestionPro provides you with all of these features, plus more. With your account created in QuestionPro, you can begin making questionnaires and surveys right away. You have a variety of options to choose when starting your survey, which include choosing and modifying a template from the template library, uploading existing surveys and questions or starting fresh from a blank template. 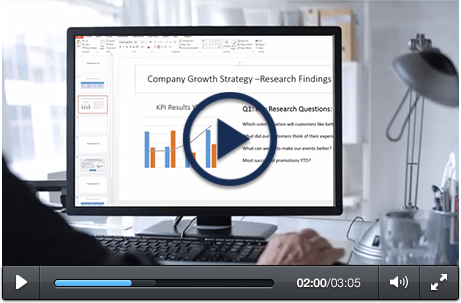 Easily edit and customize your survey using a variety of options, including easy question rearrangement, implementation of logic and changing the theme. After you're all finished creating your survey, you can distribute it using a variety of methods. If you need demographic specific respondents, you can purchase a sample through QuestionPro to take your survey. You can easily import a list of email addresses that you'd like to use as, or simply post your survey to your social media channels, such as Facebook or Twitter. Plan on working offline? You can download the QuestionPro App before hand to conduct surveys where internet may not be available. After your survey has been distributed and you begin to collect some hard data, you can do many things with it. You can start by creating infographics and word clouds with your data with just a couple of clicks. In terms of analysis, you can filter data and create pivot tables, as well as perform trend and TURF analysis. 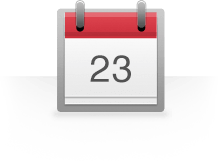 If you need your results backed up, you can download your data, export it to Dropbox or Google Docs and even schedule an export.